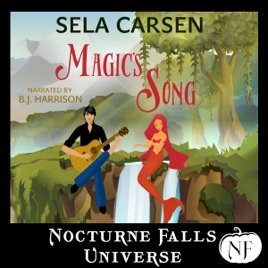 Welcome to Nocturne Falls, where there's a supernatural on every corner, if you have the magic to see them. Trick Scanlon is introduced to town when a playful horse nearly drowns him. Saved by a mermaid's song, he's just looking for a place to catch his breath. He never expects to be so drawn to his beautiful savior. Daria Don't-Call-Me-a-Mermaid Czernovitch has changed so much her stalker won't ever find her. She has great friends - witches, gargoyles, and fairies - and she feels safe...until a former Army Ranger turned country music star pulls her into his spotlight.